MackieMade Paper Creations: Paper Sweeties April 2018 Sneak Peek! 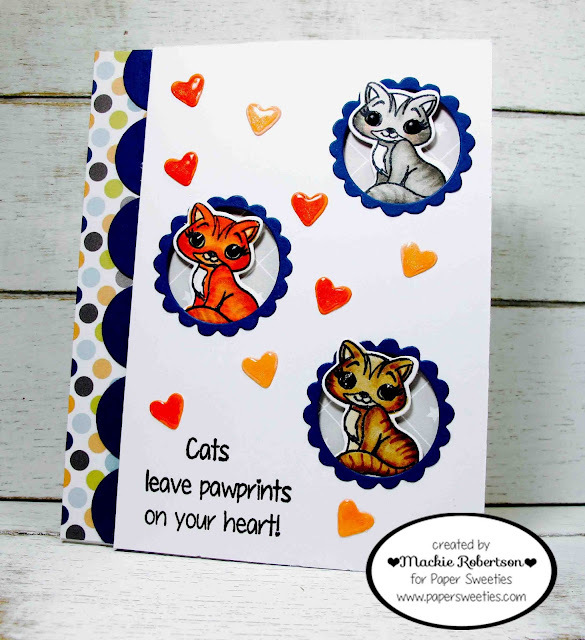 the matching SWEET CUTS to the adorable stamp set Sweeties Pets! I love, love, love these adorable kitties and doggies in this stamp set! And now we have the Sweet Cut dies! I started my card by using the Paper Sweeties Scalloped Circle dies to cut 3 holes into some white card stock. Next, I chose some fun patterned papers. I stamped the Sweeties Pets kitties onto some Copic friendly card stock and colored them with Copic Markers. Then... I was able to cut them out with the NEW matching Sweet Cuts! I think the Sweetie Pets look so cute perched in the holes I made! The scalloped border on the left side is another Paper Sweetie Sweet Cuts called Sweet Borders. Oh goodness is this ever cute! You've done a wonderful job highlighting this sweet little cat. Darling card Mackie!